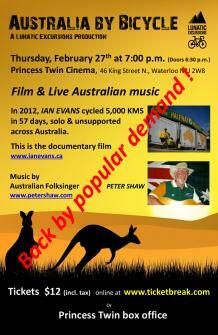 Join us for a unique “Down Under” experience including documentary film and live music by Australian Folksinger Peter Shaw! In the summer of 2012, Elora resident Ian Evans completed an epic adventure to cycle across Australia alone and unsupported. The 57-day, 5,000 km trek highlights the struggles through the desert and across the Great Dividing Range in winter, but above all it is about the Australian people Ian met and interviewed along the way. It is about their generosity in providing help, food and on one notable occasion a free beer in the middle of the desert!